Published on July 8, 2012 by Martyn. Be the first to comment! 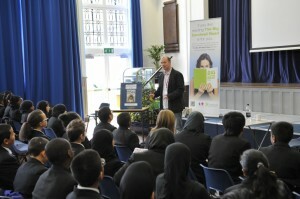 I’m looking forward to a return trip to Birmingham this week to run a creative writing workshop at Holly Lodge School, in Smethwick. 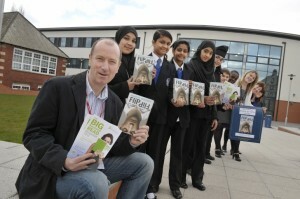 My previous visit to the school, in May (pictured), was to deliver three talks and readings as part of The Big Sandwell Read, for which Flip was shortlisted in the children’s fiction category of the annual event to promote reading in local schools and libraries. The students and staff couldn’t have been more welcoming and enthusiastic and I was delighted when Ms Sam Cartwright, the English teacher who hosted that visit, invited me back. This is my last school session as we head into the summer holidays but I’m already drawing up plans to tour again in September.